New Construction Blower Door Testing | Standard Insulating Co. If you want to make sure your newly constructed home is as airtight as possible, you may want to consider a blower door test. Getting a blower door test for your Central New York new construction project will help you ensure the correct building tightness, helping you avoid overuse of energy due to air leakage, avoid moisture problems, avoid cold air drafts, and find out how much ventilation you’ll need to ensure the right indoor air quality levels. 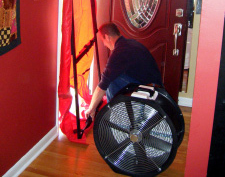 When one of the experts at Standard Insulating provides your blower door testing, they’ll mount the blower door, which is a powerful fan, into the frame of an exterior door. The fan then draws the air out of your home, lowering the air pressure inside. The higher outside air pressure then flows through any unsealed cracks and openings, helping to determine the air infiltration rate of your build. Standard offers new construction blower door testing throughout Central New York. Standard Insulating Co. will help you get the blower door testing you need to ensure your Central New York home provides you with the best possible comfort and energy efficiency, all year long. To find out how we can help you improve your Central New York home and its comfort level, as well as how we can help you save money on your energy bill, contact Standard Insulating Co. today. Call us toll-free at 1-(800) 738-1424, and we will be more than happy to assist you with your new construction blower door testing needs.